Disclosures.io is a web app that helps real estate agents more efficiently manage the documents in a transaction so they can focus on providing excellent service to their clients. Their flagship product allowed Listing Agents to more easily create and share disclosure packages. I was brought in to explore and develop a feature for the next phase in the transaction: Offers. In general, the real estate industry is not technology-forward, relying on older platforms like email and phone calls to conduct business. At the same time, real estate professionals are under immense pressure to track and organize all materials involved in a transaction for legal compliance. Currently, the offers process is plagued by multiple email threads, files too large to send via email, and Listing Agents struggling to compare terms across multiple offers. As the only researcher and designer at Disclsoures.io, I took the Offers Management feature from hypothesis to general release in six months. How might we bring organization and transparency to the process of sending and receiving real estate offers? Offers Management on Disclosures.io helps real estate agents send and receive offers in an organized and professional manner. in the Bay Area, gaining access to the disclosure package is a major predictor that a buyer party will write an offer. With Disclosures.io, Listing Agents can prompt any Buyer Agent with access to the disclosure package to write an offer and submit it directly to them. Now agents can conduct their transaction with all the documents for a property in one location. During the testing process, we discovered that Listing Agents often manually put together spreadsheets to help compare multiple offers by combing through emails and offer documents. Through a card sorting exercise, I learned that agents triangulate the viability of an offer from the price, accompanying contingencies, and the reputation of the agent who submitted the offer. Now agents have the spreadsheet automatically generated for them so that they can easily compare and share offers with their clients. When walking through the current offers process with Buyer Agents, they all mentioned that they ask for a confirmation of receipt from the Listing Agent when they send their offer. This is because offers are extremely important and time sensitive, emails sometimes aren't delivered, and they need a paper trail that the offer was read. I also learned that Listing Agents sometimes don't send a confirmation of receipt to have a strategic advantage over buyer agents. On D.io, Buyer Agents get an automatic notification the first time the Listing Agent views their offer. Our initial assumption was that offers are a conversation where each side sends their documents and counter documents like stand alone messages. But as I showed agents our prototypes, I learned that at the end of the offer, both sides need to have the same documents signed and stored away. This lead us to approach offers more like a shared folder that both sides contribute to and view. It was my job to bring the needs of real estate agents into the product development process, shaping the ultimate structure of the Offers feature and identifying future opportunities for growth. In order to quickly test our assumptions and improve the design, I started with rapid prototyping and testing. I initially used the team's assumptions about how the product should work as my starting design. The goal was to immediately get feedback from active real estate agents and iterate to gather all the requirements for an MVP. Once we defined the requirements and user stories for the MVP of Offers, I set to work designing the experience. Along the way, I conducted usability testing on important aspects of the design, such as updated site navigation and the Multiple Offer Summary. I designed a beta testing protocol to get feedback on how the feature worked in a real offers situation, which led to several improvements before the general release of Offers. After the general release of Offers, we continued to gather feedback through follow up surveys. 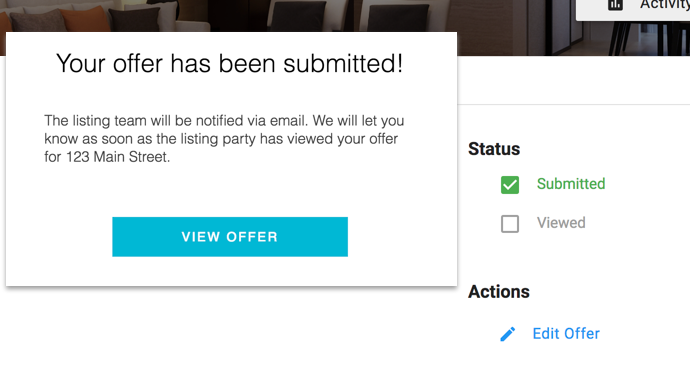 Three months after its general release, Offers had a Net Promoter Score (NPS) of 75 from Listing Agents who used it to receive and organize over 450 offers on the site. Even with the positive response from agents, we gathered a strong signal from follow up surveys about what pain points still remained in their workflow. Reach out to me to find out more about the research and design process for Offers.